Lakhdar Brahimi, Joint Special Representative for Syria and Sigrid Kaag, Special Coordinator of the OPCW-UN Joint Mission. 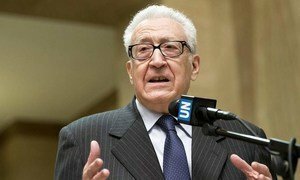 The UN still hopes for a so-called Geneva II conference before the end of the year, Lakhdar Brahimi told journalists in Geneva, reiterating the importance of a political solution to the crisis, which is now in its third year. “As far as the United Nations is concerned, we are ready and the Secretary-General is impatient to get the conference going,” said Mr. Brahimi, the Joint Special Representative of the UN and the League of Arab States. Despite trilateral discussions between the UN, Russia and the United States, diplomats were unable to announce a date for the conference and plan to meet again on 25 November. Mr. Brahimi noted that part of the delay in convening the conference is due to problems among the Syrian opposition. “They are divided, that is no secret for anybody, and they are facing all sorts of problems and they are working very, very hard to get ready,” he stressed, adding that he hoped the opposition would be able to agree on a delegation to attend the potential conference. Following the trilateral discussion, Mr. Brahimi participated in a meeting with the remaining countries that are among the five permanent members of the Security Council – China, France and the United Kingdom – and then with the countries that border Syria, namely Iraq, Jordan, Lebanon, and Turkey. Finally, he met with representatives of the International Committee of the Red Cross (ICRC) and UN humanitarian agencies. Mr. Brahimi noted that Kuwait would host a second donor conference to raise aid for Syrian refugees at the request of Secretary-General Ban Ki-moon. The first conference raised $1.5 billion in pledges. “I hope the donors will be as generous,” Mr. Brahimi said, adding that the current solution to the humanitarian disaster is not sustainable and reiterating the need for a political end to the conflict. Meanwhile, speaking to the press at UN Headquarters in New York following her first briefing to the Security Council, Sigrid Kaag, Special Coordinator of the Joint Mission of the Organisation for the Prohibition of Chemical Weapons (OPCW) overseeing the destruction of Syria's chemical weapons programme, said she had reported on the Mission's first full month of work. She told the Council of the progress to date “under difficult circumstances,” and added that the Syrian authorities were cooperating constructively with the Mission. Ms. Kaag also stressed the need for future international assistance subject to the approval of the destruction plan presented by the Syrian Government.